I am pleased to announce that after three years of research and hard work, following my first book on Matlab-Java programming, my new book “Accelerating MATLAB Performance” is finally published. 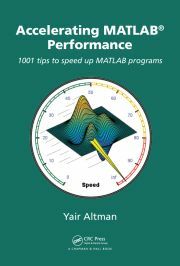 Accelerating MATLAB Performance (CRC Press, ISBN 9781482211290, 785 pages) aims to correct this perception, by describing multiple ways to greatly improve Matlab program speed. Additional information about the book, including detailed Table-of-Contents, book structure, reviews, resources and errata list, can be found in a dedicated webpage that I’ve prepared for this book and plan to maintain. Click here to get your book copy now! Instead of focusing on just a single performance aspect, I’ve attempted to cover all bases at least to some degree. The basic idea is that there are numerous different ways to speed up Matlab code: Some users might like vectorization, others may prefer parallelization, still others may choose caching, or smart algorithms, or better memory-management, or compiled C code, or improved I/O, or faster graphics. All of these alternatives are perfectly fine, and the book attempts to cover every major alternative. I hope that you will find some speedup techniques to your liking among the alternatives, and at least a few new insights that you can employ to improve your program’s speed. I am the first to admit that this book is far from perfect. There are several topics that I would have loved to explore in greater detail, and there are probably many speedup tips that I forgot to mention or have not yet discovered. Still, with over 700 pages of speedup tips, I thought this book might be useful enough as-is, flawed as it may be. After all, it will never be perfect, but I worked very hard to make it close enough, and I really hope that you’ll agree. 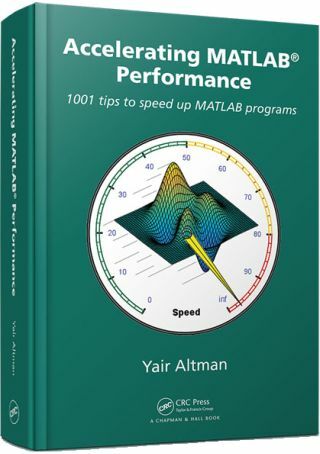 If your work relies on Matlab code performance in any way, you might benefit by reading this book. If your organization has several people who might benefit, consider inviting me for dedicated onsite training on Matlab performance and other advanced Matlab topics. As always, your comments and feedback would be greatly welcome – please post them directly on the book’s webpage.